At least, that’s what the owners of this online casino would have you believe, as they encourage you to become a ‘citizen’ of this fabled land. We need to help you to discover whether making yourself a subject of the King Billy Casino is a good idea or not! First impressions are certainly good, as a lot of care has gone into the beautiful presentation of this site. There are plenty of games on offer here, with the video slots front and centre. A tempting bonus awaits new joiners, and there are tournaments, a cool reward scheme and ongoing promotions to keep existing players happy. There is a BTC mode available where you can find all games you can play with this currency. WHAT IS King Billy Casino? 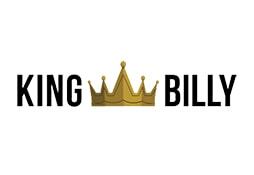 King Billy Casino was launched in 2017, so is a very new entry to the crowded online casino market. They have certainly come up with a distinctive name and character, although that name possibly won’t go down too well with certain communities in the UK. The casino is operated by Direx N.V. Casinos, a group that runs 12 other online casinos including BitStarz, Space Casino, Play Casino and Queenspin Casino. While that provides a measure of security, the fact that the site is only licensed in Curacao is something of a concern, as we always prefer to see a European license. You can enjoy four separate bonuses based on your first four deposits. These total 200% of your deposits to a maximum of $/€1000, and include 200 free spins. Your first deposit is matched by 100%, the second and fifth by 50% and the third and fourth by 25%. In that sense the ‘200%’ is a little misleading, as that’s not exactly what you are being offered here. There are some conditions attached, such as a 35x wagering requirement, meaning that actually withdrawing the bonus may prove tricky. There is a nice loyalty scheme on offer at King Billy’s Casino, whereby you can rise from a lowly ‘Citizen’ all the way up to ‘King/Queen’ by collecting points as you play. Betting $/€50 earns you one point, and you’ll need to collect 500 points to move from Citizen to Baron. There are also regular promotions which are ongoing as well as gaming tournaments with prizes on offer. The choice of payment methods on offer at King Billy Casino should be enough to keep most players happy. The credit and debit cards available are Visa and Mastercard, as usual, but there are other options too. Neteller and Skrill are popular electronic wallets for fast transactions. You’ve also got the voucher Paysafecard system for anonymous deposits. Zimpler is a nice way to make payments via your mobile phone, and that’s here too, as is Trustly, the online bank transfer system. Interestingly (and unusually), King Billy also accepts Bitcoin, the famous online currency which has surged in value in recent months. There aren’t all that many online casinos accepting bitcoin payments, so this is an advantage if you prefer to use that currency. King Billy Casino is certainly an intriguing site, and another unique feature is the selection of games. It is very rare to find a modern casino which doesn’t have any of the ‘Big Three’ game providers (NetEnt, Playtech, and Microgaming), but that is the case here, or at least it is for players in most regions. Due to licensing issues, NetEnt games are only available in selected territories, but not many of those. There is a good selection of games though, they just come from designers such as: NetEnt, Microgaming, Play N Go, Yggdrasil, Betsoft, Evolution Gaming, Endorphina, IGtech, Pragmatic Play, Rabcat, NextGen Gaming, Ainsworth, Thunderkick, ELK Studios, Amatic, iSoftBet, GameArt, Habanero, Spinomenal, BGaming. There may be some unfamiliar names in that list, which adds to the curiosity factor of this online site. Apart from slots, there is a very good selection of table games and video poker, along with some live dealer options. Currently, the site supports these languages: English, Russian, Greek, Swedish, Finnish, Norwegian, German. As we mentioned above, the Curacao licence is a concern, but we assume that if the casino hopes to break into the lucrative UK market they will work on getting the appropriate British licence. There are a lot of things to like about King Billy Casino. These include the diverse selection of games, the cool site design, tournaments and the nifty reward scheme. On the other hand, there are concerns about the license, and the absence of the big game providers will be a problem for some people. This brand new casino is entering a cut-throat market and it will be interesting to see how it progresses over the coming months and years. We will follow its development with interest.